One-sided 'sign of goodwill' offered by Israel, even as Hamas refuses discuss returning two fallen IDF soldiers' bodies for now. As truce talks in Cairo continued Sunday ahead of the five-day ceasefire extension ending Monday at midnight, Israel preempted any agreement by unilaterally offering Gaza a concession and lifting a ban on fishing in the Hamas enclave. Gaza fishermen have been blocked from their work since July 8, during the Hamas terror war on Israel, which has included several attempts to infiltrate Israel by sea. 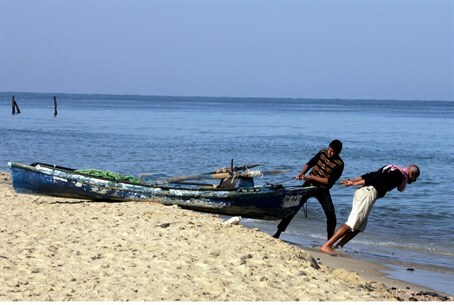 Nevertheless, "as a sign of goodwill, Israel has allowed fishing off the Gaza Strip up to 3 nautical miles," an Israeli government official told AFP on condition of anonymity. Over the past eight years, Israel has set a six-nautical-mile limit for Gaza's fishermen when tensions were lower, restricting it to three miles when hostilities have escalated. During the operation fishing was cancelled altogether due to the security threats. Besides using the sea for infiltrations by gunmen into Israeli territory, Gaza terrorists often try to smuggle weapons into the Hamas stronghold under the guise of fishing vessels. In fact, setting the fishing zone to six nautical miles has been one of the concessions that Prime Minister Binyamin Netanyahu reportedly last Tuesday attempted to "soften" ministers to accept, along with easing the blockade and borders. Talks in Cairo are based on an Egyptian proposal, which reportedly was rejected by Hamas, and which puts off difficult issues such as a disarmament of Gaza and a Hamas demand for a Gaza sea and airport for a month after the truce agreement. AFP reports that the issue of Hamas returning the bodies of Second Lt.Hadar Goldin and First Sgt. Oron Shaul hy''d, who were killed in the operation, are also being postponed until the later negotiations according to the proposal. Foreign Minister Avigdor Liberman (Yisrael Beytenu) has already stated his opposition to any agreement that doesn't include the return of the bodies of the two fallen soldiers.